A welcome at the Winchester and Portsmouth Dinner on May 7 was extended to John and Blanche Hunt, who have returned to Fareham after four years in West Germany, attached to BAOR, Münster. John has been posted to Teddington, attached to the National Physical Laboratory, but travels home at weekends. We expect his name to appear before long in our peal columns. The first dinner, nine year's ago, was in the hotel's ballroom, but because of greater numbers attending, moved to the larger dining room. This year a return was made to the ballroom, but the social side was as happy as ever, despite the smaller attendance. It was said that at no time during the nine years had the main (meat) course been repeated. This year huge steaks were on the menu and one attractive lady, after a valiant effort, finally capitulated, remarking that a "doggy bag" would have been handy (that which was left being taken home for the family pet). In another case a lady's son helped out by consuming the excess of steak mother couldn't manage. One old stager to another: "I could not make head nor tail of the account about Chute Forest and Upper Chute; then I saw the initials at the bottom and understood why". (The writer of this is writing under a pseudonym. )- D. K. G.
The reason for Devonian Bob Southwood being asked to reply to John Scott's toast was that if John used too much dialect Bob would be able to interpret!! As it turned out, both used it but the company was able to follow without too much difficulty. After the handbell touch of Spliced Surprise by the Croft family, one ringer's wife, who knows nothing about method construction, whispered to her 'husband: "I think the Bristol sounded the most musical". This proves that all change ringing does not sound the same. Notable absentees at the dinner were Arthur and Gilian Davies, from Christchurch and Dan and Mrs. Matkin (Bournemouth). Canon and Mrs. Kenneth Felstead, however, were present, as were Charles and Mrs. Kippin, their son Chris and his wife, coming up from Bristol for the occasion. The absence of a number of the older and until now, regular supporters of the Guild's social event of the year, was remarked upon by several members, but by the master (Roger Savory) in particular, when the annual dinner was held on May 7. The venue was, as before, at the Royal Hotel, Southampton, and we feel sure no more suitable or comfortable establishment could be found than the Royal. Never before, anywhere, has such a wonderful display of handbell change ringing been seen or heard at a dinner by four members of one family, than on this occasion. Mr. Kenneth Croft and sons William, John and James rang a perfect touch of 8-Spliced: London, Superlative, Pudsey, Lincolnshire, Cambridge, Bristol, Yorkshire, Rutland. It was a magnificent performance listened to in absolute silence and loudly applauded at the end. Ken and Madeline Croft must be very proud of their family and the W. & P. are fortunate to have such a talented band in their midst. The master in his comments rightly said that we had been privileged to see history in the making. 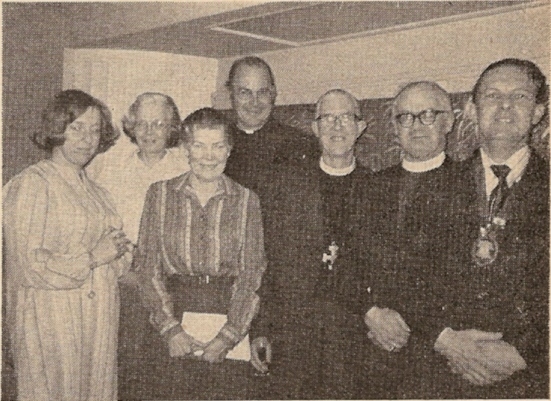 Attending his first dinner as joint president of the Guild was the Lord Bishop of Portsmouth (Rt. Rev. Dr. A. Gordon) and after the meal he thanked the Guild for the honour accorded him. Commenting on the Queen's Jubilee celebrations the Bishop said that his own Diocese was also marking the 50th anniversary of its founding. It had formerly been part of the Winchester Diocese and one elderly canon commented to him that the best way to celebrate would be to re-unite with Winchester (laughter and applause). Commenting on the Ringing World, the Bishop said it was a pity that copies were not available to church bookstalls so that visitors and parishioners could see and read what was being done by bellringers. He then introduced the Rev. John Scott (vice-president of the Central Council) who was to propose the Guild. Just before the dinner commenced this group photograph was taken, and in it are (l. to r.) Mrs. Savory, Mrs. Clare Scott, Mrs. Sylvia Felstead, Rev. John Scott, Canon Kenneth Felstead, Rt. Rev. Dr. A. Gordon (Bishop of Portsmouth) and Mr. Roger Savory (Guild Master). Mr. Scott said that since becoming vice-president he had had a number of invitations, but because of his parish duties he could not accept many of them. He then spoke of his first contact with bells: in Winchester Cathedral when at the choir school there. The 12 bells were on the floor of the nave awaiting rehanging (in 1936). The alteration in the wording could be seen for originally Edward VIII's coronation was to be celebrated and after his abdication George VI wording was substituted. Speaking of the regular worship in the church, Mr. Scott said that many ringers did not go to service after ringing, but the ringing of the bells was in itself an act of worship. The same was applicable to all the other acts connected with the church: the organist, choir, servers, cleaners, ringers and so on. All these activities were commendable and were a form of worship within the church. The Central Council and its work were then detailed by the speaker who continued by congratulating the Guild on its activities and the young element in its membership. However, there was one vital thing for which the W. & P. were responsible and which each year caused considerable discussion in the Central Council's deliberations: "For heaven's sake get another bell at All Saints', Basingstoke", he concluded amidst loud laughter and applause. Replying to the toast the Rev. Robert Southwood (chairman, Christchurch and Southampton District), like the previous speaker, a Devonian, used the county dialect to tell amusing stories. He also said that there was one thing the "Hampshire hogs" couldn't do - make a good rise and fall in peal! (laughter). A lovely 34 cwt. octave sounded wonderful if rung up properly in peal and down again the same way. Still, the ringing "in between", admitted the speaker, was passing good striking. Saying that he had been coerced into making a speech (the visitors), the general secretary (Mr. Barry Fry) asked for the charity and forebearance of the company. He then proceeded to give a very good talk on the fellowship enjoyed by members and visitors alike, enumerating the qualities of many of the guests, particularly the Bishop of Portsmouth and the Rev. and Mrs. J. G. M. Scott. Replying to the toast of "The Visitors" is Mr. John Illingworth of St. Martin's Guild, Birmingham. 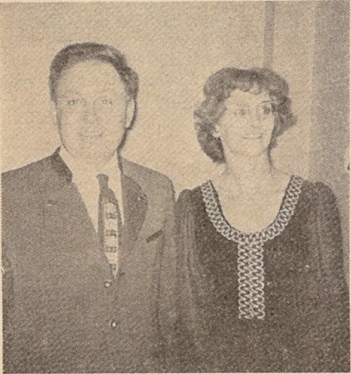 Seated on his left is Mrs. Madeline Croft. Thanking the Guild on behalf of all the guests and visitors, Mr. Illingworth, in a humorous manner, referred to various aspects of ringing and the ringing fraternity, from hiding belfry door keys for ringing tours, organising peals, meetings and - ringers' dinners. He felt the word "visitor" was inapt and that ringing friends was more appropriate, and as such all the guests and ringing friends present thanked the W. & P. members for their hospitality. 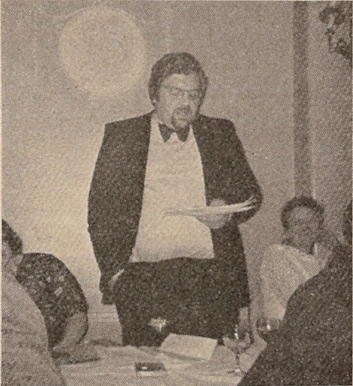 The master in winding up the formal proceedings expressed thanks to all concerned in the organisation, spoke of a recent visit he had paid to Houston, Texas, and ringing progress there, of the return to England from Germany of John and Blanche Hunt, and concluded by asking the Guild members to think carefully about continuing the annual dinner, in view of the absence of the older members. We need something on the social side, he said, but we want all members, young and old, to join in. Inflation was hitting so many people that it may be necessary to modify the costs of the social activities. The company then split up into smaller groups to reminisce, to plan, or to discuss the various meetings and operations in the Guild's future. The bar was open till 11.30 and was well patronised.